Download "NORTH CENTRAL TEXAS COLLEGE COURSE SYLLABUS. Juvenile Justice CJSA 1317 sec. 310. Instructor s Name Cherly Gary Office Phone # Cell Phone #"
1 NORTH CENTRAL TEXAS COLLEGE COURSE SYLLABUS Course Name & Number Juvenile Justice CJSA 1317 sec. 310 Semester & Year Fall 2008 Instructor s Name Cherly Gary Office Phone # Cell Phone # Instructor s Office # 339 Office Fax # Address Office Hours Mondays 1:00-5:00 Tuesday 11:00-12:00 Wednesday1:00-5:00 Friday by appointments only. If these office hours are not convenient for you, you may schedule and appointment with the instructor. Should you need immediate assistant and I am not in my office, please feel free to call me on my cell phone. Catalog Description A study of juvenile justice process. Topics include specialized juvenile law, role of the juvenile law, role of the juvenile courts, role of the police agencies, role of correctional agencies, and theories concerning delinquency. 3 Other Pertinent Information Scholastic Integrity In fairness to all students, no assignments will be accepted late. All work must be turned in on the scheduled date and time. All weekly assignments will be turned on at 8:00 a.m. on Saturday turned off at 11:00 p.m. on Friday. Make-up exams may be given if a valid excuse is presented at the instructor s discretion. Students must send the instructor an e- mail if he/she is not going to take an exam at the scheduled time. All students who do not make up an exam will receive a zero for the missed exam. All s must be sent through ANGEL. Please do not send an from your personal account. If a student has any questions or concerns, please feel free to contact the instructor. 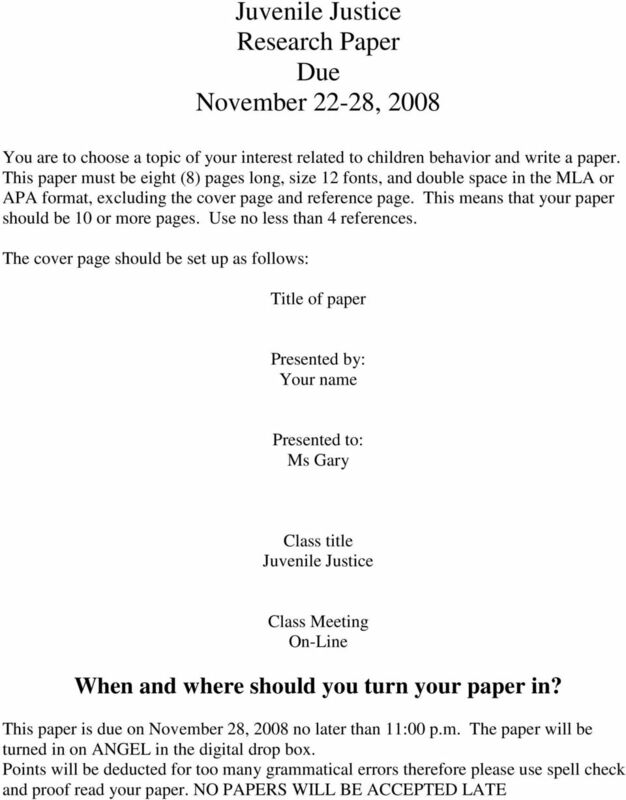 The student MUST have an acceptable word processing program installed on the computer he or she will be using to complete course work. 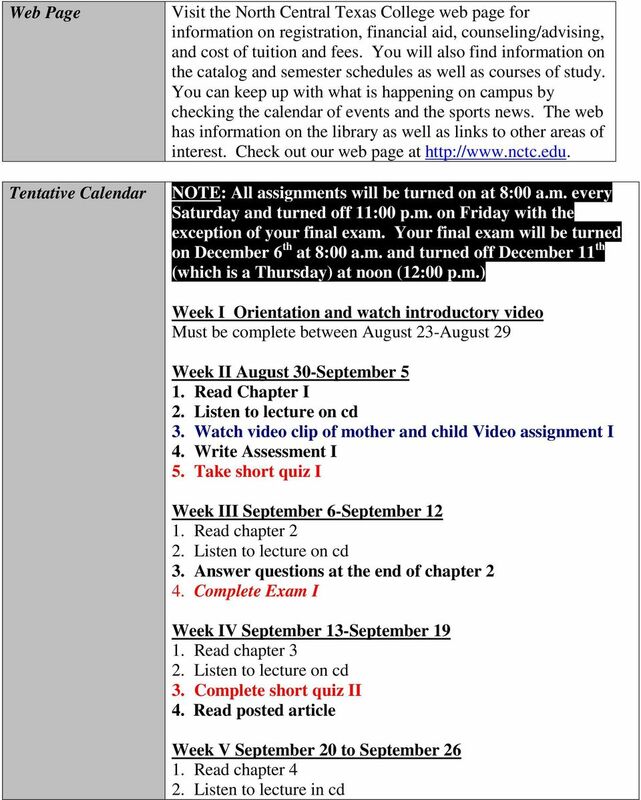 The student MUST have Internet connectivity and an acceptable Web browser (see course information in Angel) to complete course work. 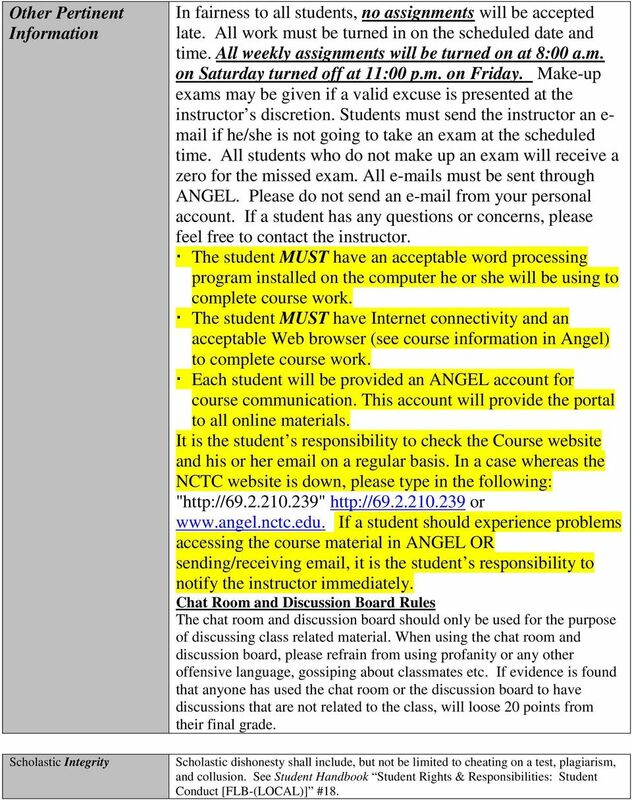 Each student will be provided an ANGEL account for course communication. This account will provide the portal to all online materials. It is the student s responsibility to check the Course website and his or her on a regular basis. In a case whereas the NCTC website is down, please type in the following: " or If a student should experience problems accessing the course material in ANGEL OR sending/receiving , it is the student s responsibility to notify the instructor immediately. Chat Room and Discussion Board Rules The chat room and discussion board should only be used for the purpose of discussing class related material. When using the chat room and discussion board, please refrain from using profanity or any other offensive language, gossiping about classmates etc. If evidence is found that anyone has used the chat room or the discussion board to have discussions that are not related to the class, will loose 20 points from their final grade. Scholastic dishonesty shall include, but not be limited to cheating on a test, plagiarism, and collusion. See Student Handbook Student Rights & Responsibilities: Student Conduct [FLB-(LOCAL)] #18. 4 ADA Statement EEOC Statement North Central Texas College is committed to providing equal access to educational opportunities to its students with disabilities by providing assistance through reasonable accommodations ; and a variety of services and resources through the Special Populations Office. The College does not discriminate on the basis of disabilities in admission or access to its programs. Students are responsible for notifying the office of their need for assistance at least two weeks prior to the beginning of a semester. Students with documented disabilities such as mobility, hearing or visual impairments, learning, and/or psychological disorders are eligible for services. ACCESS Program: The ACCESS Program provides accommodations for students who have a documented disability. A disability is anything that can interfere with learning, such as a learning disability, psychological challenge or physical illness or injury. Accommodations may include extra time on tests, tests in a non-distracting environment, note taker in class, etc. On the Corinth Campus, contact: Robin Truhe ) or Penny Cogbill ) in Suite 170. On the Gainesville Campus, contact Mary Martinson (940) ext. 4377) in ASC 111. Student Success Center: The Student Success Center is designed to help all students at NCTC develop tools to achieve their academic goals. Students can attend free interactive workshops about Time Management, Study Skills, Test Anxiety, Choosing a Major, Learning Style Strategies, Career Exploration, and much more. This program also links students to FREE tutoring, including a Writing Center, a Math Lab, and free online tutoring in the evening and helps new students acclimate to college by providing new student orientations and THEA/Compass Test Preparation. All students are invited to visit the Student Success Center. We are located in Rooms 160 and 170 in Corinth and 114 in Gainesville. TRIO Program: TRIO Programs are federally funded programs which offer services designed to assist students in achieving their academic goals. Services include educational workshops, academic advising, tutoring, personal counseling, career counseling, cultural enrichment, and financial aid information. 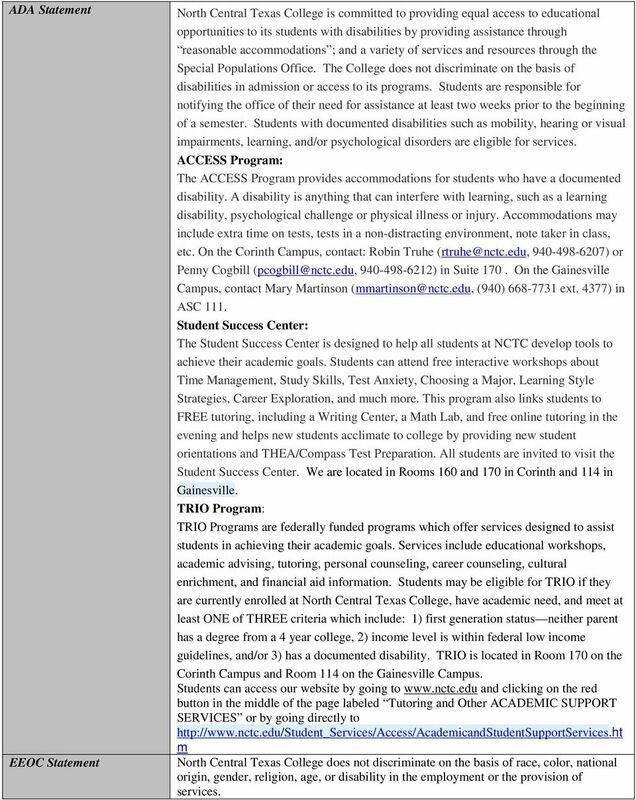 Students may be eligible for TRIO if they are currently enrolled at North Central Texas College, have academic need, and meet at least ONE of THREE criteria which include: 1) first generation status neither parent has a degree from a 4 year college, 2) income level is within federal low income guidelines, and/or 3) has a documented disability. TRIO is located in Room 170 on the Corinth Campus and Room 114 on the Gainesville Campus. Students can access our website by going to and clicking on the red button in the middle of the page labeled Tutoring and Other ACADEMIC SUPPORT SERVICES or by going directly to m North Central Texas College does not discriminate on the basis of race, color, national origin, gender, religion, age, or disability in the employment or the provision of services. 7 1. Read chapter Listen lecture on cd 3. Extra credit (answer questions at the end of chapter 11 and 12) 4. Meet for on line chat Week XIII November 15 to November Read chapter Listen lecture on cd 4Answer question at the end of chapter Exam V Week XIV November 22 to November Read chapter 14 and Listen lecture on cd 3. 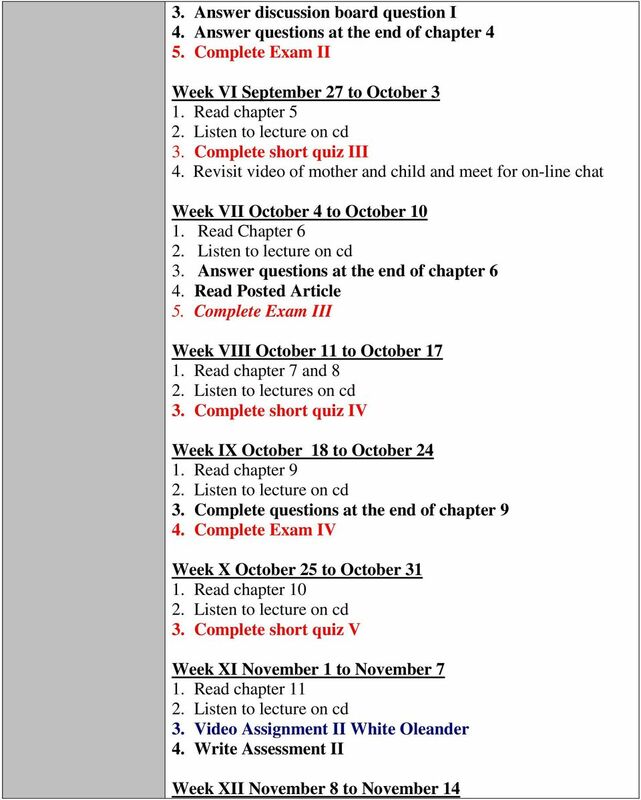 Papers Due Week XV November 29 to December 5 1. Read chapters 16 and Listen to lectures on cd 3. 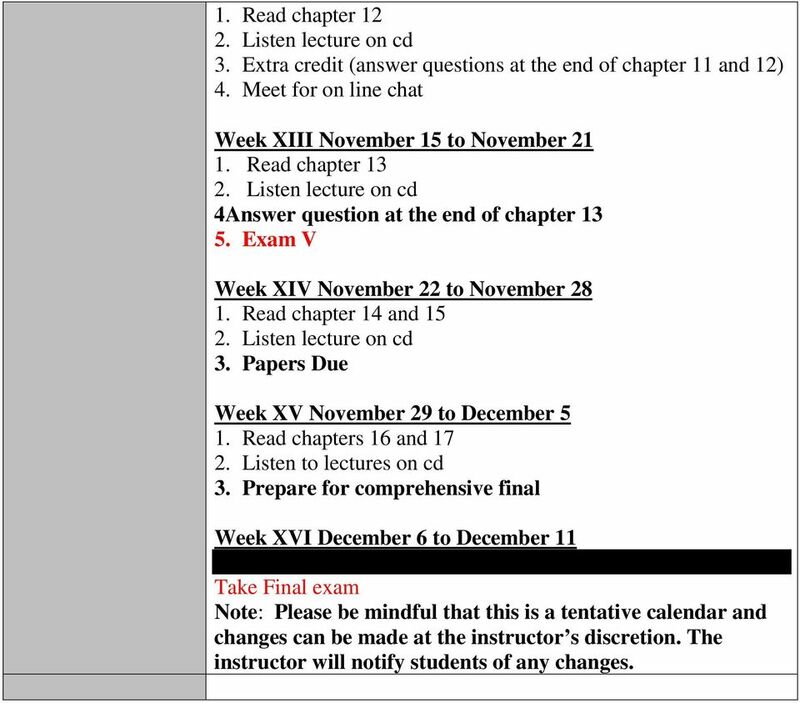 Prepare for comprehensive final Week XVI December 6 to December 11 Exam will shut off at 12:00 p.m. Take Final exam Note: Please be mindful that this is a tentative calendar and changes can be made at the instructor s discretion. The instructor will notify students of any changes. 8 Workforce Education Program Elements (SCANS Skills) The Secretary s Commission on Achieving Necessary Skills (SCANS) conducted extensive research and interviews and determined that workplace know-how consists of two elements: foundations skills and workplace competencies. These SCANS Skills are referenced with each course objective and are as follows: (1) Foundation Skills (a) Basic Skills: A worker must (i) read, (ii) write, (iii) perform arithmetic and mathematical operations, (iv) listen, and (v) speak effectively. (b) Thinking Skills: A worker must (i) think creatively, (ii) make decisions, (iii) solve problems, (iv) visualize, (v) know how to learn, and (vi) reason effectively. (c) Personal Qualities: A worker must display (i) responsibility, (ii) self-esteem, (iii) sociability, (iv) self-management, (v) integrity, and (vi) honesty. (2) Workplace Competencies (a) Resources: A worker must identify, organize, plan, and allocate resources effectively. This includes (i) time, (ii) money, (iii) material and facilities, and (iv) human resources. (b) Interpersonal Skills: A worker must work with others effectively to (i) participate as a member of a team, (ii) teach others new skills, (iii) serve clients/customers, (iv) exercise leadership, (v) negotiate, and (vi) work with diversity. (c) Information: A worker must be able to (i) acquire and use information, (ii) organize and maintain information, (iii) interpret and communicate information and (iv) use computers to process information. (d) Systems: A worker must understand complex interrelationships as in (i) understanding systems, (ii) monitor and correct performance, and (iii) improve and design systems. (e) Technology: A worker must be able to work with a variety of technologies, e.g. (i) select technology, (ii) apply technology, and (iii) maintain and troubleshoot equipment. B. Intended Audience: Freshman level course. 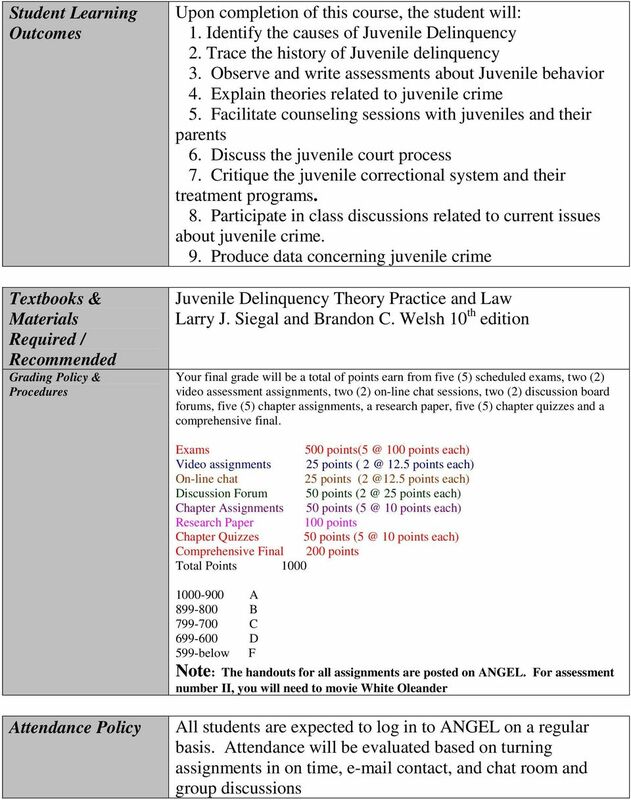 Angelina College Technology & Workforce Division CRIJ 1313 Juvenile Justice System - ONLINE Summer I 2015 Course Syllabus I. BASIC COURSE INFORMATION: A. Course Description: CRIJ 1313 Three (3) hours credit. BRAZOSPORT COLLEGE LAKE JACKSON, TEXAS SYLLABUS ACNT 2311: MANGERIAL ACCOUNTING ONLINE VERSION COMPUTER TECHNOLOGY & OFFICE ADMINISTRATION DEPARTMENT CATALOG DESCRIPTION ACNT 2311 Managerial Accounting. Introduction: How does a student get started? How much time does this course require per week? 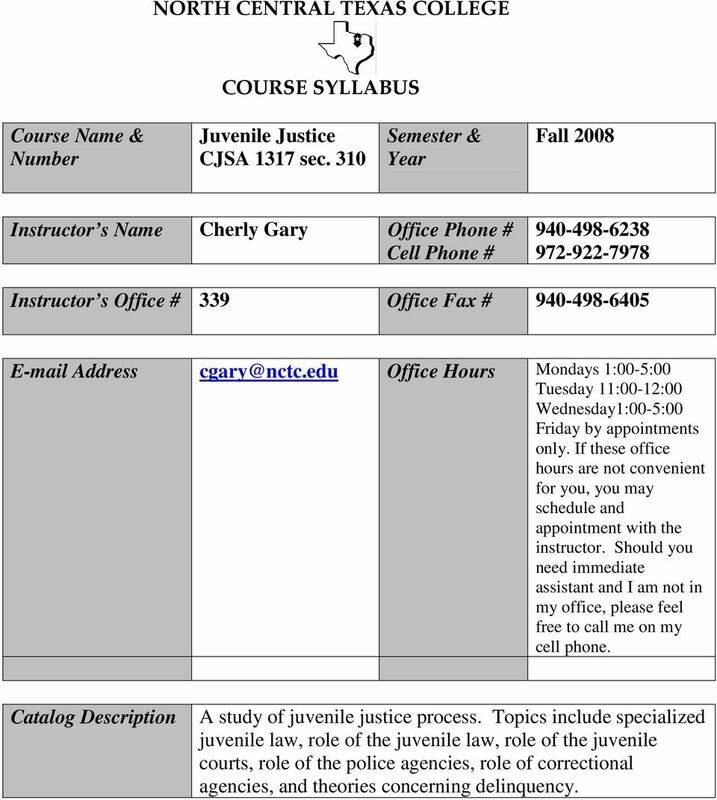 CMJ 260-D01 Criminal Justice Field Experience Fall 2015 Syllabus. Office Hours: Monday: 10:45 A.M. 11:45 A.M. 5:30 P.M. 6:30 P.M. Course Syllabus POFT 2312 BUSINESS CORRESPONDENCE & COMMUNICATION Revision Date: 10/1/2015 Catalog Description: Development of writing and presentation skills to produce effective business communications. South Plains College improves each student s life. COURSE SYLLABUS FIREWALLS & NETWORK SECURITY ITSY-2301 Number 2-3-3 Lecture - Lab - Credit ITSY-1342 Prerequisites April 16, 2015 Revision This syllabus has been reviewed and is current on the date indicated.